pregnancy is making me OCD(er). I sweet-talked the ultrasound tech at the hospital to “take a peek” at the baby today. just to check his position. please, baby muffin, stay that way for 11 more weeks. then come out. head first. i’m a crazy nerd, I know. but I felt good knowing right now things are on track. so far. i’m a little behind this week, but it’s been pretty busy. i spent 2 solid days recovering from the flu. then drove back for class on thursday and friday, returning friday night… and worked all weekend. I’m really excited for jesse to be a dad. he’s really excited to get the baby OUT and actually get to know the little guy. he calls the baby by his name all the time at home (it’s a secret… no mom, i’m not spilling the beans on the blog early either! )… sometimes I think jesse is more excited for the actually person this little man will be, and I’m more excited for a baby in the house. jesse is not into the whole pregnancy belly. one night i was trying to get him to be patient and feel the baby moving around – he looked me straight in the eye, kinda frowned and said, “honestly honey, the belly freaks me out. i’m excited for the baby when he’s acutally here, but this is weird.” ok, fair point. from what i can tell, jesse wants a healthy baby here and his wife’s waistline back 🙂 me too, sweetie! oh, and i asked him if he wanted to attend the child birth class. i am 100% willing to go, even though i’m as well versed in labor and delivery as i possibly could be for my first baby. 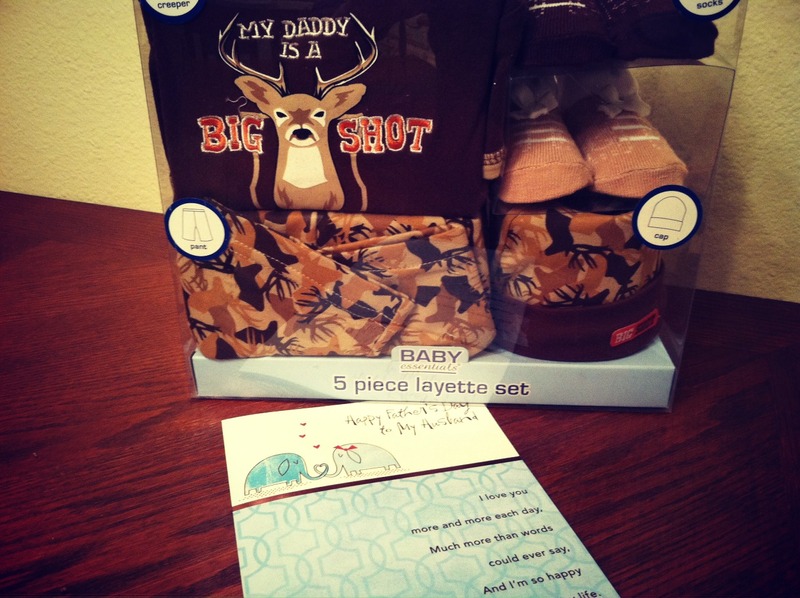 his comment: “you’ve done everything but actually shoot the bun out of the oven. as long as you’re conscious, we’ll be fine.” gotta love a staight-forward answer. (i TOTALLY support childbirth classes by the way, just don’t think i will personally benefit much from them). and while we’re on the subject of fathers and their day, i CAN NOT wait until my dad is an official grandpa. i just want this little boy to be grandpa’s helper on the farm. he asks every time we talk how “little muffin” is doing, which is so cute. and when i was at home 2 weeks ago the look on my dad’s face when he saw how big my belly had grown was priceless. one of those moments when you know he was faced with the fact i’m a big girl now! as for me, i keep growing. i have my glucose tolerance test tomrrow… i’m nervous, especially after tiny, little kearney got her GD diagnosis. i’m a mtn dew drinker, i drink at least one a day. selfishly, if have to give that up, i’ll cry. i will literally cry. friday during class muffin was definately breech… i got a solid lightening strike to the cervix when he kicked – it made me jump in my chair. and i could rock his little head back and forth from under my right ribs. i started to have a pregnant lady panic attack driving home. i don’t have the mental capacity for a cesarean and grad school. and the hospital where i am supposed to deliver just got a “D” rating… mostly based in their not-so-awesome surgical care. so then i started mentally planning going back to the hopsital i worked L&D at, the one with my family, friends, and beloved Dr.K to have an scheduled cesarean. by the time i got home, i had come to terms with my new birth plan. one with a family-centered cesarean. i’m not even 28 weeks yet people. at 27 and a 1/2 weeks, i’m having a mental freak-out over a real or not-real cesarean. someone needs to slap me. 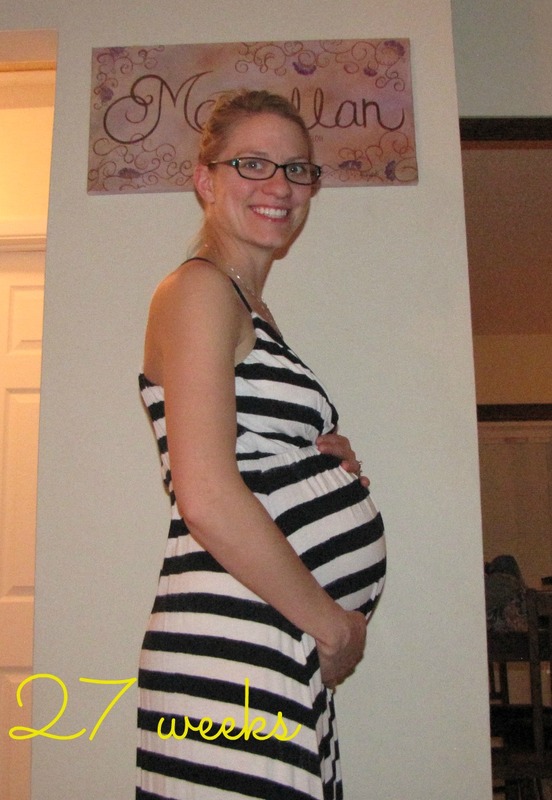 and here’s the bumpdate from last week… i look so darn tired. stupid flu! but look at that BELLY. yeesh!